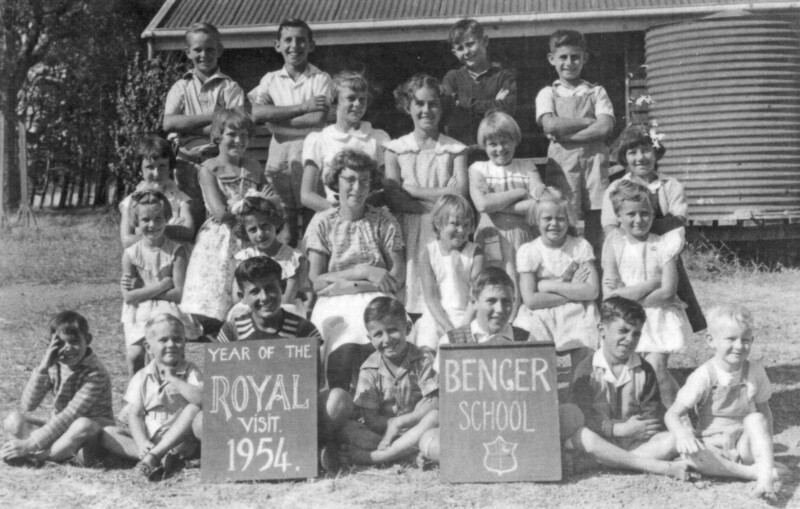 At Benger, a settlement within the Harvey Shire, school opened for the first time in the Benger Community Hall which was then also used as a church, following negotiations between the local Progress Association and the Education Department. Classes began in February 1918 and a school photo in 1919 shows students attending were Ken Tindale; Roy, Bill, Bob and Tom Barnes; Bill, Os, Paul and Gurney Fry; Linda and Ruby Offer, Peggy Connor and Andrew McMillan. As the hall was proving inadequate, in 1928, the Benger community through their various clubs and associations raised money towards the building of a new and badly needed school. Mr Stephen Fry, a long-term resident of the Benger district, offered land on which to build, or should that be unsuitable, twenty pounds. His offer of land was accepted and the new school opened in 1928. Over the years, the Benger Primary School suffered the usual fluctuation in numbers, carrying the same worry about closure, as numbers fell. That finally happened in 1996 after sixty eight years. In some cases, four generations of a family began their education there. Valued as part of the district’s history, the school building still stands and has been incorporated into the new Benger Heritage and Community Centre. With a grant from the Lotteries Commission, money from the sale of the old hall site and a further contribution from the Harvey Shire Council, the new centre was opened in 1998. The opening was a memorable event and included a reunion of old families, past pupils and teachers. Marion Lofthouse & Kerry Davis (eds), Shire of Harvey, Proud to be 100, 1895 – 1995 Centennial Book. Shire of Harvey, Harvey, Western Australia, 1995. Notes of speeches at the Benger Heritage Community Centre opening.